Workout Wednesday aka Happy National Running Day! Happy National Running Day! If you are like me, your Facebook & Twitter feeds are blowing up with reminders of what today is. I know many of us “pledged” our miles a long time ago (or so it seems), and hopefully we were all able to follow through! I took two days off to recover from Virginia Wine Country Half Marathon, but was back at it yesterday and today. The weather was beautiful both days – very little humidity and cooler! Still in the 80s, but after this weekend, it feels amazing. I may have mentioned it before, but I have a gym/recreation membership through Mason so that if the urge strikes, I can get my miles in at lunchtime and still have a place to shower (well, & for cross-training purposes, but I’ve used it mostly as a place to shower lately). It’s so nice to get those miles in earlier in the day & be done with it, especially since I am in summer classes now. I know this will be impossible during the majority of the summer when it will just be too hot and humid to do anything outdoors, but for now, I will enjoy! I hope you get some happy miles in, too! May’s total mileage count was 102 miles. I think January was the last time I actually broke 100, so it was sort of exciting to see that. I know those numbers are only going to start going up, up, up starting in July – yikes! 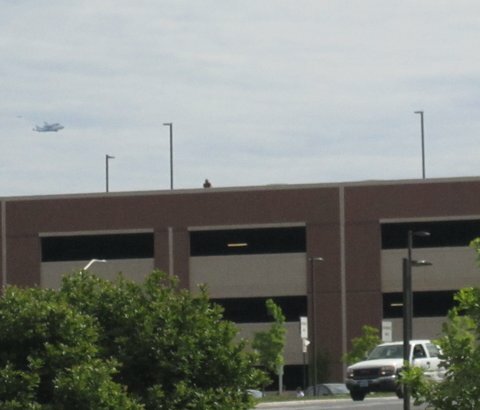 Just like the rest of the DC area, my colleagues & I eagerly awaited the arrival of the Discovery space shuttle today. My boss is really into space & obviously we are a space-oriented family, so between the two of us, we were really invested in making sure we saw SOMETHING. 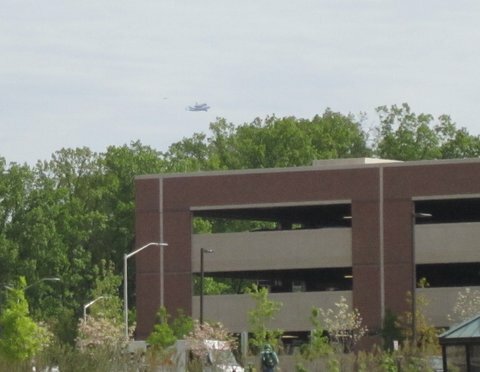 The university campus is pretty close to Dulles, so we really hoped that we’d get to see it flying above us en route to Udvar-Hazy. Armed with our iPhones (for Twitter updates, of course) & our cameras, we ventured out a little before 10am and kept watch. 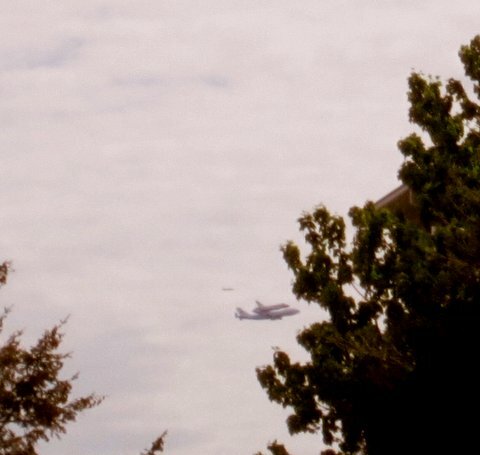 Every plane that flew by us was followed by, “OMG, could this be it? !” and then a disappointed sigh when we realized it wasn’t. About thirty minutes into standing outside, we began seeing tons and tons of planes flying around us. A quick scan of Twitter showed that it must have been all of the planes being allowed to take off again from Reagan. We knew that this meant the DC fly-over had to be over and that we should start being on a serious lookout. After a few minutes of nothing (and no Twitter updates), we started feeling pretty discouraged until we heard someone shriek “THERE IT IS!” and lo & behold, there it was. It was SO obvious that we all felt like idiots for even entertaining the idea that another plane could have been it! It was an absolutely amazing sight but the whole time I kept feeling so badly for Brian who had to watch from inside. 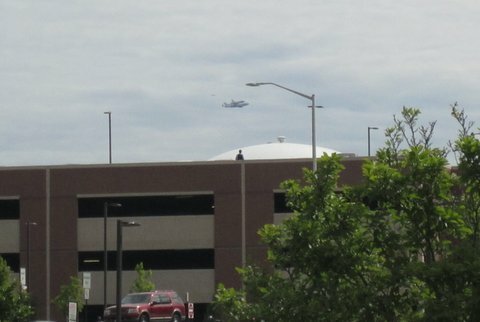 It seems like all of the people who deserve to see it flying over the skies in person are the ones who are stuck watching from their super-secret spacey buildings! Anyway, here are some pictures! FYI: I don’t think you’ll really be able to see the full effect of them unless you click for the full-sized image. Sneaky chef week 1 & a 5k! Week 1 of using the Sneaky Chef has been a huge success! I already talked about the Creamy Chicken Noodle Soup, but since then we have tried chicken parm & taco soup. The chicken parm included pureed broccoli, peas & spinach (when I was doing it, Brian said, “it smells like death in here!”) but in the end, Brian ended up eating more of it than the rest of us (and that’s partly bc he takes leftovers to work for dinner on the night shift.) Today I made taco soup which includes shredded chicken, salsa, tomato paste and 2 purees: the white bean puree (same one we used in the chicken noodle soup) and an orange puree (which includes sweet potatoes and carrots.) All in all, I am really happy with the book so far, but it involves a LOT of preparation and I’m the only one who will do it because obviously I’m the one trying to sneak the veggies in. We’re taking a week off from Sneaky Chef this week & just going with some recipes from Cooking Light. of a full-time job. It has been a little bit of an adjustment, but overall, I am very happy. Audrey probably can’t say the same thing, though, since now she is in daycare more often. We have been lucky so far because Brian’s shift-work schedule has allowed him to spend a LOT of time with her rather than us having to send her to daycare for 8-9 hours a day, 5 days a week. It also makes it easier for me to go to work knowing that Audrey won’t necessarily be in daycare all day long. She has only been in daycare for about 2 days and (of course) has the daycare-induced cold. I know it’s inevitable (it happens every time we put her back there after a break), but it is still sad to see her not feeling well! Top that off with her 6th tooth pushing through, and she is a clingy little girl! So far I have loved my job…well, maybe not the position as much as the organization. Working for GMU (and the state) has so many perks associated with it. 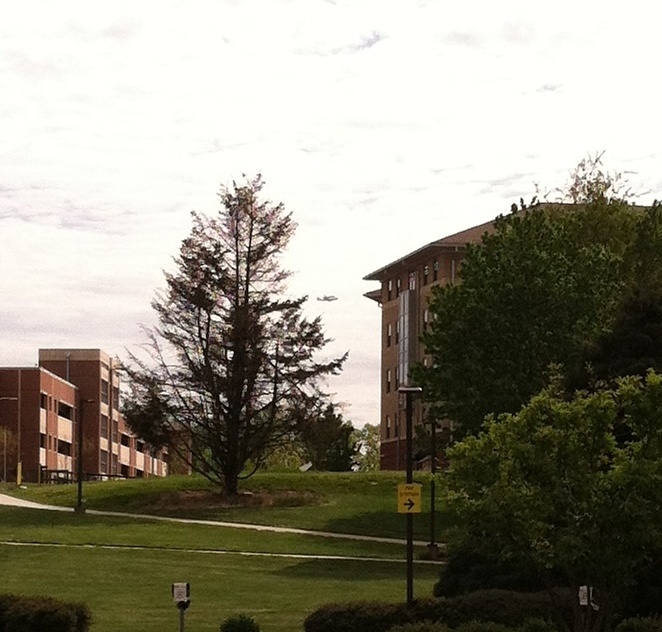 UGF had some of those perks, but take that and multiply it by like, one hundred, and that’s how much better GMU’s are. It helps, of course, that GMU is a state school and is gigantic and has so many more opportunities. Check out Audrey’s new sandbox and water table!